I'm very excited about this new series for February. Almost a year ago, I had the privilege of sharing some of my story with the middle and high school kids. During our time, I handed out 3x5 cards for them to write questions on. We were able to go through a few of them, but I really wanted to come back and answer the others. I am excited to address their questions. Each Wednesday this month, I will be answering the questions that the young people gave me. Today's common theme among a few of the questions was how to handle relationships when your friend won't take the time to listen to you. "Why do some girls only talk about themselves and completely ignore my personal interests?" "My best friend tells me EVERYTHING that's on her heart, and I give her advice about them, and pray about them too. But when I talk to her about my feelings, she doesn't do the same. It kind of goes through one ear and out the other." ""If the person in the relationship wants you to listen to them, but in my case, all the other person wants to do is talk about themselves, how do you fix that? I don't wanna be blunt and ruin the relationship, but I really want it to stop. The person is very strong-willed." Well girls, there's not an easy answer, and it's not going to be what you want to hear but let's address this. I have had my share of "listener friends" and "talker friends." It's important to understand that both are necessary and it's necessary to BE both. Everyone needs a listening ear once in a while, particularly when you are in middle and high school, they are tough years of relationships to navigate. Your friend is obviously in need of a good listening ear and you are JUST the person to do it. How do you be a good listener and look past your own discomfort? b. Think about how you want to be treated when you need a listening ear. Even if your "gifting" is not necessarily listening, everyone can learn to be a good listener by stepping aside of your own emotions in the moment and remembering how you have been treated in the past and how you would rather be treated or listened to. c. Remember that you are friends with her for a reason, think about those reasons and don't put too many expectations on her. Expectations will make or break a relationship. When you put expectations on a friend that requires her to act as you anticipate her to, you will end up hurt. We are unpredictable beings, so keeping your expectations on humans low, but your expectations on Jesus high, you will succeed and your friendship can flourish. So, how does friendship work both ways if you must keep expectations low, and how is your friendship-o-meter to be filled? Ask her to pray with you, ask her to listen to you - verbalize your need to share things with her. 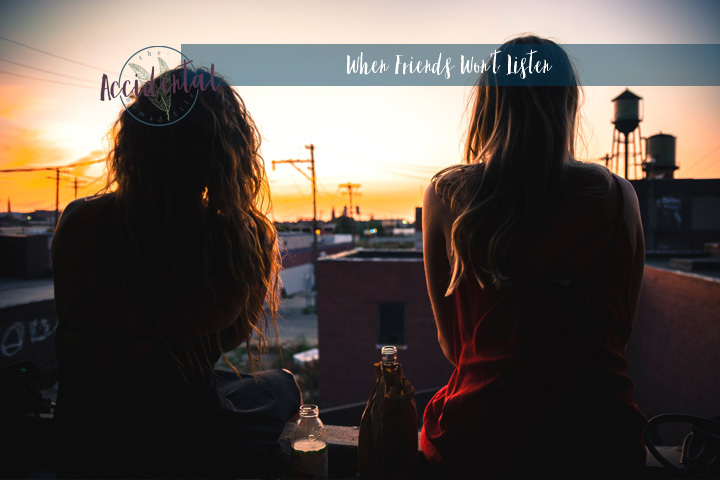 If she still seems to be loosing your words out the back of her head, perhaps you need to find another friend to confide in and look at this friend as a ministry for you to listen to. Remember that it's ok to take a break from friends, maybe you need to reach out to other people for a while. This can be so healthy for both of you as long as you can express to her that you are not angry with her or upset with her. Maybe make it an adventure for both of you and challenge her to reach out to x amount of other people, while you do the same and when you feel enough time has passed, you can share what you've learned with one another. If your friend is so strong-willed and refuses to listen to your simple need of being heard, she's not a good friend. Perhaps you need to move on all together if that is the case. Which ever route seems right for your friendship, be sure to be praying about it, pray for her, pray for wisdom, and pray for grace. It can be so difficult to know how to properly handle emotional situations like this, but ultimately, the best thing you can do is bring it before Jesus.